We started seeing that many people include plyometric exercises in their workout routines. Wherever I go, I always see battle ropes, plyo boxes in gyms. Actually, these were not really popular before however there is a myriad of reasons to include plyometric sessions in your routine so nowadays almost every gym has them. Also, if you do boxing, MMA, or any other martial arts training, this training has seriously vital importance for you and you can find why it is vital at the end of this writing. Without further ado let’s start amazing benefits of plyometric training. Plyometric exercises activate the fast twitch fibers and these fibers can’t be activated by many weightlifting exercises. It can improve your muscle mass significantly and keep in mind that there are many plyometric exercise types. If you do different plyometric exercise types regularly, you can surely have bigger and denser muscles. Plyometric exercises also improve the efficiency of these fibers and in that way, these muscle tissues tend to have more muscle mass. Is not this unbelievable? It is like improving the muscle building potential and I am sure that many people would really love having it. I know that many bodybuilders do battle rope training for bigger, denser shoulders and arms and based on my experience it is the best plyometric exercise for having bigger and more rounded shoulders. If you are looking for these, definitely have a look at these good battle ropes. I also included my own experiences in there. There are many plyometric exercises and most of them can be used for cardio sessions. For example, you can burn up to 1100 calories per hour with box jumps. As you know, plyometric exercises also build muscle in an efficient way. So just like heavy bag training you have aerobic and resistance training at the same time. So your muscles look way denser. You can also do different cardio types. You can do steady state, HIIT and you can focus on your lower body with plyometric boxes or upper body with battle rope training. There is literally a training type for every need. Obviously we don’t have symmetrical muscles. For example, I use my right arm more for punching during my boxing training and I have a noticeably bigger right arm or you may kick with your left knee more during your MMA session and have a stronger left leg. With that, you can fix these with plyometric exercises. For example, you can fix your upper body with battle rope or medicine balls. You can also do the same for your lower body with depth jumps. Explosive training is building the maximum amount of power in a very short span of time. 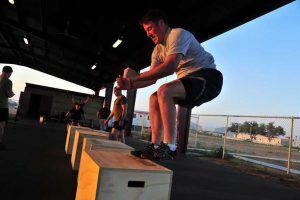 According to many authoritative figures, some plyometric exercises are the best ways for improving explosive strength. After I had spent considerable time with battle ropes, I also started doing way more powerful punches in a shorter period of time. It actually became really useful for my sparring sessions. Some most common exercises are power slamming with battle ropes and box jumps for it. We all know that skipping rope has very low-impact on joints. But did you know that doing hurdle jumps, kettlebell swings and other plyometrics also have low-impact on your joints? Well, I honestly did not know that and I think everyone would agree that having such an intense workout without hurting your joints is a really huge plus. So, plyometrics are simply suitable for everyone. Your muscles need to work in coordination so you can have the benefits from plyometrics in a maximum way. For example, if you can’t slam or wave the battle ropes in a continuous way, you can’t expect to get all the benefits, can you? Or while you jump on a plyometric box, your upper body and hands also need to work in coordination so you can jump higher. The list can easily go on but you get the point. 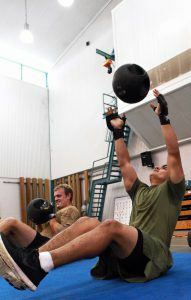 There is seriously a myriad of different plyometric exercises including push-ups with medicine balls, tuck jumps… Thanks to a lot of different exercise types, your muscles work differently. Also, your brain is stimulated more with different exercises. This also helps with many other things such as improving muscle mass, strength, and fat burning. After all your muscles work in a different way for each exercise. I am a boxing and MMA training junkie but sometimes even I want to stop punching and kicking my freestanding heavy bag and start slamming the battle ropes, improve my vertical with box jumps or do chest throws with medicine balls. There is truly a plyometric training type for every taste. If You Do Martial Arts Training, Plyometric Exercises are Vital! Plyometrics exercises improve many useful skills for martial arts. If you can punch with more explosive power, you are more likely to knock out your opponent or when you have more balanced muscles it will be easier for you to change your center of gravity. This is vital for striking, dodging or even moving. This can even help you save energy. So if you do any kind of martial arts training, simply include plyometrics in your routine! As a side note, you can see that there are many professional fighters who do this training religiously. Also, boxing science (one of the authoritative figures in boxing) always includes battle rope training (as 3 minutes intervals) in boxers workouts. You can build denser muscles, lose fat, improve explosive strength and many more skills with plyometrics and if you have not included these exercises in your workout routine, you are definitely missing out on a lot of things. I also have benefited from them greatly and I have really fun time while I am slamming battle ropes. If I missed any benefits of plyometric training or you have anything to share, please leave a comment below and let’s talk. Wow!, after reading this post, it seems that plyometric exercises are a must for muscle and strength building. You have explained the benefits very well. The evolution of physical training has reached an unbelievable level from the single exercise machines like a exercycle or a stepper. Amazing! This is why many professional basketball players, boxers… included plyometrics in their exercise routines. They just don’t mess around and try improving their strength as efficient as they can. This is interesting and thanks for sharing your knowledge in easy to digest bite sizes. I have seen people doing these exercises but never in my mind did it occur to me that they have such benefits. What does power slamming with battle ropes do for your body? Upper core muscles? Exactly you can have an incredible upper body with battle ropes and if you are interested, you can check out other benefits. Hey Logan, I completely agree with you man. I just simplified it in the writing and did not go into details so readers don’t get bored too much ; )I also feel really light after any plyometric sessions and the reason is that having maximum contraction in the smallest time interval. This is why may people also prefer this training type. One always gets a feeling of accomplishment after a good work out. I am sure that is the feeling one will get after doing Plyometric training. Thanks for the post.